Position yourself on hands and knees with hands directly below shoulders and knees directly below hips. Maintain normal breathing throughout the exercise. Cat: Inhale and contract your abdominal muscles. Round your spine toward the ceiling while tucking in your chin to your chest. (Bottom illustration). Have patient on lie down on their back, one leg flat on the ground and the other flexed. One hand is placed under the small of the back and the other is placed on the stomach. Patient tries to approximate lower rib cage to pubic bone. Shoulders should elevate approximately one inch above the ground. Ensure the motion is not lead with the head. Maintain neutral neck position so there is no flexion about the neck. Elevate slowly and hold contraction for about three seconds and then lower slowly. Never lose abdominal stabilization throughout the set. Ensure maximal abdominal contraction. Repeat 10x, 2 sets. Raise buttocks off the ground and hold body in suspended position. Ensure there is a straight line between your knees, hips and shoulders. Keep the body as straight as possible. If shoulder pain is experienced the upside arm can support the weight bearing arm. Maintain neutral spine, brace and breath. Ensure there is a straight line between your feet, knees, hips and shoulders. Kneel on the floor and place your hands in front of you, shoulder width apart in quadruped position. Ensure that hips are over the knees and shoulders are over the hands. Initially practice lifting one hand and the opposite knee off the floor by about an inch to gain confidence and balance. When ready, slowly lift one arm straight ahead of the body keeping arm parallel to the floor, while at the same time lifting the opposite leg straight back to a level also parallel to the floor. Squeeze the gluts while bringing the leg back. 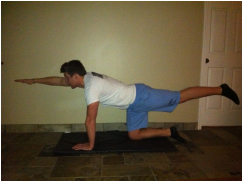 Hold for 5-8 seconds at this top position then slowly lower both the arm and opposite leg. Now repeat with the opposite arm and leg. Ensure pelvis and shoulders do not rotate throughout exercise. Also try not to lift the arms or legs above parallel to the floor.